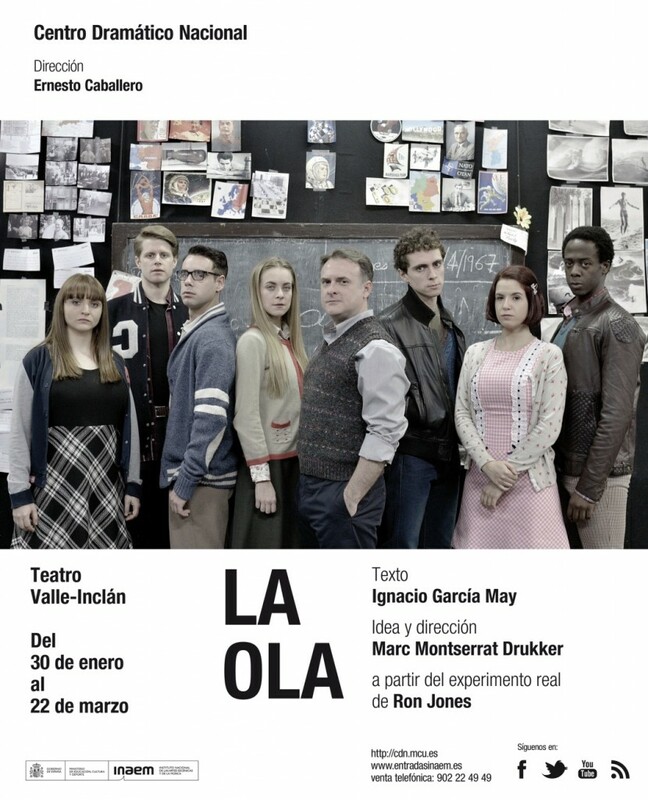 A CDN (SPAIN'S NATIONAL THEATRE) PRODUCTION OF "LA OLA" (THE WAVE). Finalist for the “PREMIOS ADE 2015" awards, for “BEST DIRECCION". Nominated by the Spain's Stage Director's Associacion. ASSISTANT COSTUME DESIGNER AND COSTUME SUPERVISOR: MIREIA LLATGE. CAST: XAVI MIRA (RON JONES) / JAVIER BALLESTEROS (ROBERT) / DAVID CARRILLO (DOUG) / JIMMY CASTRO (NORMAN) / CAROLINA HERRERA (WENDY) / IGNACIO JIMÉNEZ (STEVE) / HELENA LANZA (ALINE) / ALBA RIBAS (SHERRY). DO YOU KNOW THAT FEELING WHEN YOU TAKE YOUR SEAT AT A THATRE AND, FROM THE VERY FIRST MINUTE, YOUR EYES ARE FIXED ON THE STAGE AND YOUR ATTENTION IS MAINTAINED THROUGHOUT A 2-HOUR SHOW? THAT IS EXACTLY WHAT HAPPENS WITH “LA OLA” (“THE WAVE”) … THERE IS SOMETHING SO WELL WORKED ABOUT THE RHYTHM OF THIS PRODUCTION THAT IT GRIPS YOU IN A VERY SUBTLE WAY. IT IS NOT LIKE YOU ARE WATCHING AN EXPERIMENT FROM ABOVE, LIKE THE MOVEMENTS OF A GROUP OF GUINEA PIGS CRAMMED INTO A TRANSLUCENT BOX.. NO! IT IS AS THOUGH YOU ALMOST FORMED PART OF THE EXPERIMENT ITSELF. PERHAPS THE SECRET OF SUCH A GREAT PRODUCTION IS THAT IT IS LIKE A PATIENTLY WELL PREPARED DISH. NOT IN VAIN HAS MARC MONTSERRAT-DRUKKER (…) SPENT OVER SEVEN YEARS WORKING ON THIS PROJECT. (…) THERE IS NOTHING LACKING HERE AND NOTHING SUPERFLUOUS. IT IS AN ABSOLUTE DELIGHT, AND A CALL TO ATTENTION FOR US NEVER TO LOWER OUR GUARD. RECOVERING HISTORY IS WHAT IGNACIO GARCÍA MAY AND MARC MONTSERRAT-DRUKKER HAVE ACHIEVED WITH THIS EXTREMELY INTERESTING AND NECESSARY CENTRO DRAMÁTICO NACIONAL PRODUCTION (…) AND MONTSERRAT-DRUKKER’S STAGING IS INSTRUMENTAL IN THIS. (…) EVERYTHING WORKS AS IT SHOULD, WITH FRENZIED PACE AND VIBRANT CHARACTERS THAT ARE SUSTAINED THROUGHOUT THE PLAY. A LIVELY PERFORMANCE WITH NO PRETENTIOUSNESS OR UPSTAGING ATTACHED, IN WHICH EACH STEP, WHETHER PHYSICAL OR PSYCHOLOGICAL, EXPLAINS JUST HOW THESE YOUNG STUDENTS CAME TO CHAMPION THE «JONESIAN YOUTH MOVEMENT». (…) WE CAN APPRECIATE ALL THEIR EFFORT AND TALENT AND SENSE THE SOLID, AND ALMOST CHOREOGRAPHIC, WORK AS A GROUP AND THE REMARKABLE GESTURAL DETAILS AND CHARACTER CONSTRUCTION INVOLVED. (…) WHAT IS MOST IMPORTANT, HOWEVER, IS JUST HOW APPROPRIATE AND IN TUNE THIS PRODUCTION IS, TO THE EXTENT THAT. EVERYONE SHOULD GO AND SEE IT AND SUSPEND THEIR BELIEF THAT HISTORY HAS NOTHING TO DO WITH US. MARC MONTSERRAT-DRUKKER, STAGE DIRECTOR AND FATHER OF THE PROJECT, EXPERTLY MOBILIZES A GROUP OF EXCELLENT YOUNG ACTORS AND ACTRESSES. (…) “LA OLA” (“THE WAVE”) COMFORTABLY COMBINES HUMOUR, DRAMA, SOCIAL AND MASS PSYCHOLOGY AND THE CURSORY ANALYSIS OF CERTAIN FACTS WHICH GARCIA MAY SERVES UP PRACTICALLY RAW, WITH NO SWEETENERS OR TASTE ENHANCERS. IGNACIO GARCÍA MAY RECREATES THESE CLASSES WITH A FORMIDABLY STURDY AND DISTURBINGLY PREVAILING TEXT, WHILE PLAYWRIGHT AND DIRECTOR, MARC MONTSERRAT-DRUKKER, TAKES US TO THE CLASSROOMS OF A 1960s HIGH SCHOOL WITH BLACK STUDENTS, POSTERS OF CHE GUEVARA AND HIPPIE PACIFISTS OPPOSING THE WAR IN VIETNAM. (…) THIS BOLD PRODUCTION – ENTITLED “LA OLA” (“THE WAVE”) AND STARRING THE IMPECCABLE XAVI MIRA – ALSO WARNS US AGAINST POPULISM IN ALL ITS VARYING DEGREES AND THE EASE WITH WHICH UTOPIAS NEST WHEN PEOPLE ARE DESPERATE. ERNESTO CABALLERO, WHO ADMIRABLY MANAGES THE CENTRO DRAMÁTICO NACIONAL (SPAIN’S NATIONAL THEATRE), HAS WISELY BROUGHT THIS PRODUCTION, DIRECTED BY MARC MONTSERRAT DRUKKER AND TEXT WRITTEN BY IGNACIO GARCIA MAY, TO THE VALLE-INCLÁN THEATRE. YOU MUST GO AND SEE IT! STAGE DIRECTOR MARC MONTSERRAT-DRUKKER AND DRAMATIST IGNACIO GARCIA HAVE COMBINED THEIR TALENTS TO BRING US THIS SUPERB PRODUCTION BASED ON A REAL-LIFE EXPERIMENT BY RON JONES. THE RESULT IS A MUST, OF GREAT THEATRICAL AND EDUCATIONAL QUALITY. (…) THEY HAVE GIVEN THE PLAY –WHICH LASTS APPROXIMATELY TWO AND A HALF HOURS – THE SUFFICIENT FORCE TO HOLD THE ATTENTION OF THE AUDIENCE THROUGHOUT. (…) EVERYTHING ABOUT THE PRODUCTION IS WORTHY OF THE SPECTATORS’ ADMIRATION. (…) ALL THE CAST MEMBERS GIVE SOLID AND CLASSY PERFORMANCES WITH HIGHLY CREDIBLE CHARACTERS, EACH ENDOWED WITH A PARTICULAR ESSENCE AND PERSONALITY, THAT SET THEM APART TO THE VERY END OF THE PLAY. THEATRICALLY. “LA OLA” (“THE WAVE”), A CENTRO DRAMÁTICO NACIONAL PRODUCTION NOW RUNNING AT THE VALLE INCLÁN THEATRE, HAS ENORMOUS VIRTUES. IT IS DIFFICULT TO STAGE SUCH A COMPLICATED TEXT WITH SUCH IMPLICATING IDEAS. (…) MARC MONTSERRAT-DRUKKER, THE PLAY’S DIRECTOR, HAS SUCCESSFULLY ENDOWED THE PLAY WITH MOUNTING TENSION, INTERESTING CHARACTERS AND ORGANIZATION. THE ACTORS AND ACTRESSES ARE PERFECT IN THEIR ROLES (…) THERE WERE MANY YOUNG PEOPLE AT THE PERFORMANCE I ATTENDED. AND THEY FOLLOWED THE PLAY WITH GREAT RESPECT AND IN ABSOLUTE SILENCE. THE WORK OF IGNACIO GARCIA MAY (…) TOGETHER WITH THE SKILFUL STAGE DIRECTION OF MARC MONTSERRAT-DRUKKER MAKE US FEEL AS IF WE WERE DIRECTLY WITNESSING MUCH MORE THAN A THEATRE PERFORMANCE, AS IF WERE INDEED “VOYEURS” OBSERVING LIFE ITSELF. THE SHOW, PRESENTED BY THE CENTRO DRAMÁTICO NACIONAL (SPAIN’S NATIONAL THEATRE) IS MORE THAN INTERESTING AND FULFILS THE DUAL ROLE THAT THEATRE HAS ALWAYS HAD: ON THE ONE HAND, QUALITY ENTERTAINMENT AND, ON THE OTHER, A CALL TO REFLECTION AND INTERNAL DEBATE, TO MAKE US THINK AND MOVE ABOUT IN OUR SEATS. THE PRODUCTION, WHICH IS CURRENTLY RUNNING IN MADRID, IS HIGHLY RECOMMENDABLE AND AN ABSOLUTE MUST FOR ALL THEATRE-LOVERS. OCCASIONALLY, THEATRE HAS THE CAPACITY TO CONFRONT AUDIENCES WITH TOUGH AND IMPORTANT EXISTENTIAL AND HISTORICAL QUESTIONS, AND WITH MUCH GREATER FORCE THAN ANY OTHER PERFORMING, PLASTIC OR CINEMATOGRAPHIC ART. SUCH IS THE CASE WITH THE SOCIOLOGICAL EXPERIMENT CONDUCTED BY TEACHER RON JONES WITH HIS STUDENTS AT AN AMERICAN HIGH SCHOOL IN 1967 AND ADAPTED TO THE THEATRE WITH PERFECT TIMING AND MASTERY BY IGNACIO GARCÍA MAY BASED ON AN IDEA BY MARC MONTSERRAT-DRUKKER (WHO IS ALSO THE DIRECTOR OF THE PLAY). THIS PRODUCTION IS ONE OF THE MOST LUMINOUS AND COMPELLING OF RECENT TIMES (…) JON BERRONDO’S SET DESIGN, MARIA ARAUJO’S COSTUMES, ALBERT FAURA’S LIGHTING AND FRANCISCO GRANDE’S AND IGOR PINTO’S SOUND CREATION ARE ALL JUST PERFECT. THE PLAY ITSELF DOES NOT EXPLAIN THE OUTCOME, AND NEITHER WILL I HERE, ALTHOUGH ALL THE REMAINING PERFORMANCES AT MADRID’S VALLE-INCLÁN THEATRE ARE SOLD OUT. (…) WORD OF MOUTH MUST HAVE ALERTED AUDIENCES AS TO THE NEED TO SEE THIS SHOW, AS INDEED THERE ARE PRODUCTIONS THAT ARE MUCH MORE THAN MERE PLAYS. THEY ARE EXPERIENCES THAT HAVE BEEN CREATED SO THAT SOCIETY MAY DEEPLY REFLECT UPON HOW WE FUNCTION AS INDIVIDUALS AND HOW WE FUNCTION AS PART OF A COMMUNITY. (…) SHOWS LIKE THIS SHOULD RUN ETERNALLY AT OUR THEATRES AND BE COMPULSORY FOR LEADERS, TEACHERS AND SOCIETY IN GENERAL.